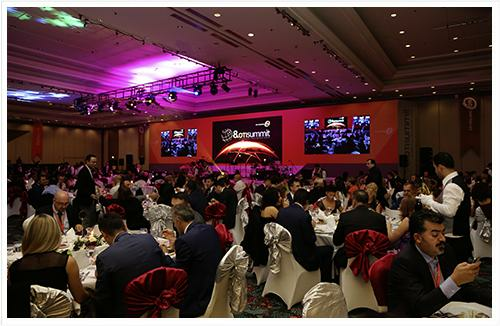 Managing and Coordination Board of OTI Holding, coordinators, counselors and managers of affiliate companies in each country have convened at 8th OTI Summit organized at Xanadu Resort Belek between 23-25 October. The event organized with the participation of nearly 370 managers coming from Turkey, Russia, Ukraine, Poland, Belarus, Georgia, Egypt, Thailand, Greece, Spain and UAE, started on October 23 with group meetings. A seminar on "World Economy", which was organized on the same evening, was given by Emin Çapa, Economics Director of CNN Turk. Ayhan Bektas, Chairman of the Board of Directors of OTI Holding, opened the main meeting held on October 24, Saturday with his opening speech and general briefing. Following the meetings where affiliates made their presentations, Coskun Yurt, Deputy Chairman of the Board of Directors of OTI Holding, made a general assessment speech, and Board of Directors Panel was held. During the Gala dinner held on the same evening, personnel who have completed their 5th, 10th, and 15th years in the company were granted seniority awards and plaques. The guests sang "10th Year March" in unison while watching the film especially prepared for the October 29, Republic Day on the evening where emotional moments were experienced.